Tuesday brings more Bike Fun on the Poky Pedaling Potluck Picnic. Poky Pedalers can again look forward to a nice bike ride coupled with a delicious feast. The Poky Pedaling Potluck Picnic meets on Tuesday August 11 at 5:15 PM in Goerke Park near the entrance to the swimming pool. From there, we’ll ride 3-to-5 miles on calm streets and non-motorized paths to a mystery park location that is different each time. At our picnic destination, we’ll unpack all the goodies that we carried on our bicycles and sample from all the delicacies provided. Last year, Parkwood Park was the mystery park for one of our Poky Pedaling Potluck Picnics. We’ll visit another mystery destination for our picnic this Tuesday. As always, I’ll provide an ample amount of my vegan 7-P Salad: Poky Pedaling Potluck Picnic Palate Pleasin’ Potatoes. I’ll also bring enough plates, cups, and utensils for the group, although Poky Pedalers are encouraged to bring their own. Poky Pedalers are welcome to be as plain or elaborate as preferred when it comes to your potluck picnic contribution (no alcohol please). If you want to keep it simple, just bring some veggies and dip or a bag of chips or a carton of orange juice. Those who feel more creative can make some sort of salad or dessert and bring it along. All picnic contributions are equally appreciated. If your bike isn’t setup well for carrying things, other Poky Pedalers always have extra space so we’ll figure out a better way to transport your contribution to our picnic spot. 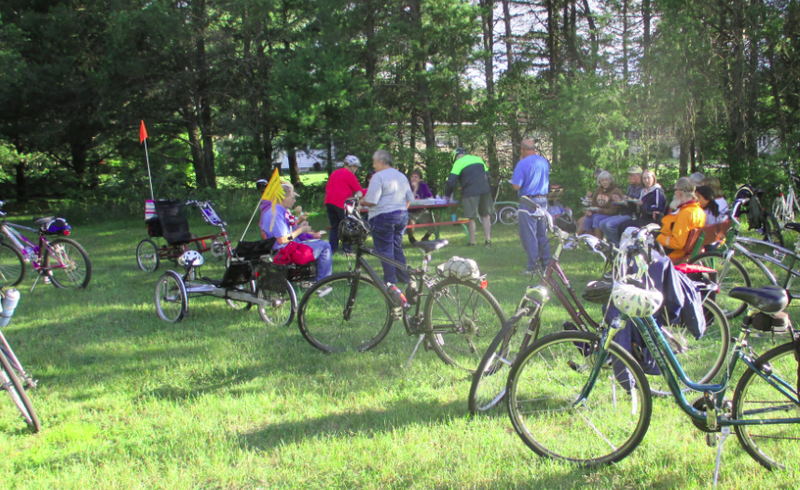 If this is your first Poky Pedaling Potluck Picnic, this webpage will give you a better idea of what to expect, and it also offers a few more suggestions regarding picnic contributions. Once we’ve completed our feast, we’ll pack everything back onto our bikes and head off. I will be returning to our starting location, so Poky Pedalers who want to return to Goerke Park can join me. The forecast for Tuesday calls for sunny skies with temperatures in the mid-70’s. It should be a lovely evening for a picnic in the park. This will be our last Poky Pedaling Potluck Picnic for the year. So make your plans to join us. I look forward to sharing Bike Fun with all Poky Pedalers on Tuesday.